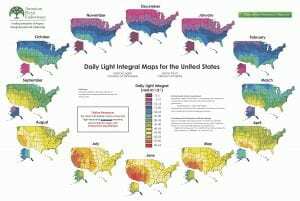 Daily Light Integral Maps for the U.S.
Daily Light Integral (DLI) maps display the ambient light delivered daily during each month across the entire U.S. These maps were researched and developed by James Faust of Clemson University and Joanne Logan of The University of Tennessee. They are unique because DLI is a measurement of light that is particularly valuable for estimating plant growth. Other solar radiation maps created for photovoltaic purposes, i.e., installing solar panels, are not directly applicable to horticultural applications. According to Faust, the project leader, the DLI maps are valuable because they allow growers to better manage the light environment of their plants. “For example, one can estimate the number of days per year that supplemental lighting may be necessary to achieve the desired plant growth during winter months or how much shade cloth may be required to reduce the light intensity delivered to crops during the summer months,” says Faust. The new maps provide high-resolution data. For example, an individual data point for every 10 km2 across the U.S., from 21st-century data. GPN Magazine published the previous version of the maps in 2002. The editor said that this issue was the most requested one that they have ever had. The lighting companies have placed copies of the maps on their website and regularly pass them along to customers. Growers often post the maps on their office walls to remember the dramatic changes in DLI that occur month-to-month. Educators have regularly used the maps to help to demonstrate the dynamic nature of horticultural light management to both growers and students. If you would like to receive a FREE 22 x 28 inch full-color DLI map poster, please contact AFE. You can see Faust and Logan’s full scientific manuscript here. Faust, James E. and Joanne Logan. 2018. Daily Light Integral: A Research Review and High Resolution Maps of the United States. HortScience 53(9):1-8. I would like to know more and understand if there is a correlation between DLI and the Daily UV Index across the country ? Where can I find relevant information about this ? Hi Ed, We’re reaching out to Jim Faust to help answer this question for you. We’ll have him touch base with you directly.